Our hearts puff up when we sample with these airy berry confections. Perfect as a light dessert (after a light meal) – since the night is young, people! 10 ounces berries, fresh (or thawed from freezer) – blackberries, raspberries, strawberries, or try roasted peaches! Using your finger, very lightly smear the insides of each souffle ramekin with oil. Lightly dust with granulated sugar and set aside on a baking sheet. Weigh out your berries when they are frozen (if using frozen), and include all berries and any juice that they release when thawing in recipe. Place the berries in a saucepan with cornstarch, lemon juice and a few tablespoons of sugar and bring up to a simmer, stirring regularly until all the cornstarch and sugar dissolves, about 5 minutes. Press the puree through a fine mesh sieve, stirring until you have nothing left but pulp and seeds. Discard that, and pop the strained puree into the fridge to chill to cold. Separate the eggs into two bowls – whites in one and yolks in another. Whip the yolks with most of the remaining sugar until light, lemon colored, thick and ribbony. Add the chilled raspberry pure and combine. Whip the whites with cream of tartar and add the last couple tablespoons of sugar when they begin to thicken, and keep whipping until they form firm, glossy peaks, not dry. Add ⅓ of the whipped egg whites, “the sacrifice,” to the yolk and puree mixture and combine to lighten. Then add the remaining whipped whites, carefully folding to preserve as much air as possible. You are looking for a lofty texture. 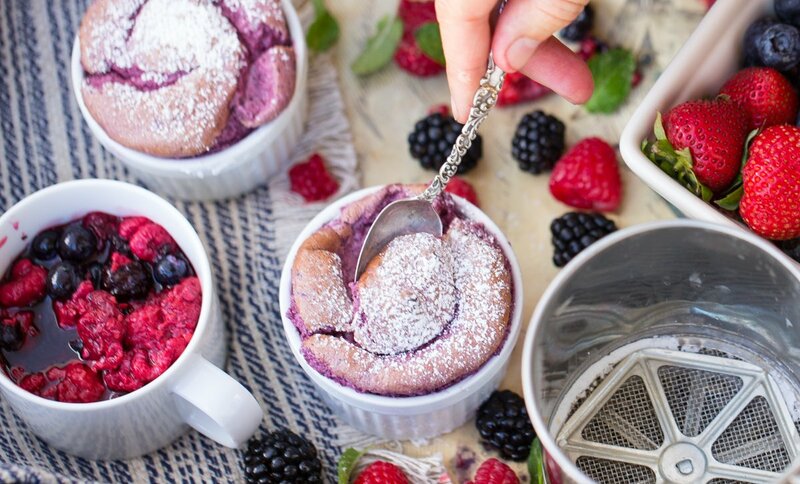 Gently spoon souffle mixture into prepared ramekins, filling each to the top, then smooth with a knife so you’ll have a straight top, using the tip of the knife like we did in class to release the batter from the ramekin. If you were a master whipper, you may have some extra – resist the temptation to overfill as these will rise! Bake until they rise beautifully, and spring back ever so slightly when gently touched. Try not to open your oven door for the first 10 minutes of cooking so they can take full advantage of the hot oven. They will take 15 to 20 minutes. Remove from the oven, dust lightly with powdered sugar if you like and serve right away (who could wait?!) Another option: drizzle with melted chocolate for an extra decadent treat! Say “I love you berry much” with a Hipcooks Gift Certificate! 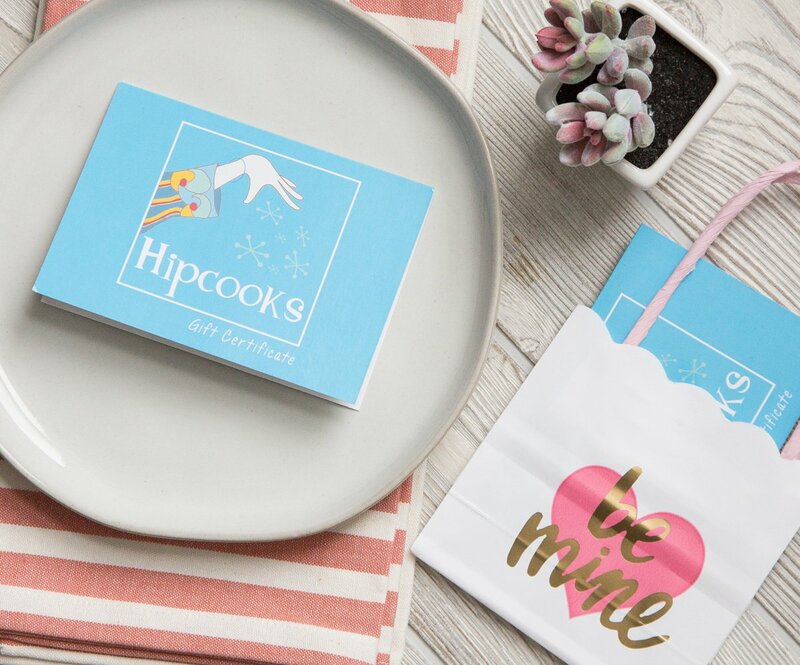 Our Gift Certificates never expire & if the object of your affection is well, shall we say, challenged in the kitchen, then Hipcooks is a super-fun way to inspire & engage. Hipcooks students love to practice on their Best Beloveds, so it’s a win-win for you, Sweetcheeks.